I love the app and how it deals with storage. However, I would appreciate if the notifications I receive would be easy to get rid of. I have had the same red notification sign since I have gotten the app and I have no way of getting rid of it. The notification bothers me but I can’t get rid of it so if it’s possible for you to fix that issue. Great app. Enjoy it very much. Awesome job. I love that it stores all my memories. It does a lot of editing without getting too bogged down. Unfortunately, it doesn’t allow customized collages. This app is so great. I no longer have to worry about not having space for my videos on my phone because this app backs all of them up. The assistant suggestions are always nice to browse, and I love how I can change the date of the photo or video if it is wrong. You can also add "notes" to it to find it with the search bar at the top. The only problem is that the background app refresh doesn't work very well to upload a video while my phone is in sleep mode, but other than that it's perfect for what I need. Love the app, especially the google photos assistant. 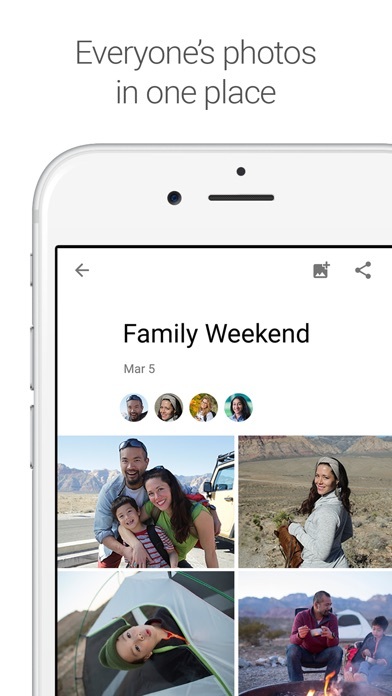 Google Photos helps organize by date, place and even recognizes people’s faces. Easy to use. Free unlimited storage for photos and videos. Works great on my iOs and Android devices. Like so many other Google apps, this app is so useful as it protects your memories even if you lose your gadgets. It frees up space on my phone and I can access my photos from any device just by logging into google! If google photos had unlimited storage it would be the best thing since sliced bread! It’s pretty close, though! I would like to see better capabilities for assembling photos into a slide show. More animation, fade in/outs, title slide creation tools. I seem to remember there were tools like this but for some reason, you removed them. Love love love it!!! Best photography app for sure!!! Google Photo is awesome, I don’t use any other photo apps at all anymore. The app put together a movie using all photos of my two dogs that passed away, and it brought me to tears. I love it !! Google Photos is a sure way to save Photos seamlessly from your phone. And the added bonus in which it has created GIF, collage, short films, and other awesome Photoshop/editing. Also love how it catagorize group of pics. ☺️. I had a little bit of a struggle getting all my icloud photos to Google photos but I’m so glad I stuck with it. My storage is now clutter free. Google photos is way more fun and it even creates movies/albums for you. I plan on backing my phone up to Google Drive so I don’t have to pay for icloud anymore. I’m a Google convert! THANK YOU GOOGLE! Easy to use, it is great!!! App is amazing, just wish on iPhones that it would be like the photos app that you could make profiles and other things using google photos. Easy to use! Easy to share, create memory books, and easy to find pics. I use this to backup all my pix. I've lost pictures before and it is a huge loss! Hopefully NO MORE!! It's nice knowing thousands of my photos are safe online seamlessly backed up when ever I'm on WiFi. Google lens surprises me every time. Suggestions are like reading my mind while swiping trough photos. Sharing is so easy and powerful! Also new design is beautiful! One of the must have apps on every device. So great to be able to save all of our photos to Google Photos! I really really really like it!!!!!!!!!!!!!!!!!!!!! Great app!!!!! I highly recommending!!!!!!!! I like the fact how I can save thousands of photos without needing another usb memory device, and the best thing that I love it is the importance for high security to keep safe your account and all your pictures. Thanks Google for this amazing app!!!!!!!!!!!!!! Por qué me gusta Google Fotos. Google Photos is amazing! Love the sharing feature and being able to create large sized albums. You only have to add 500 or less pics to an album separately. I love assistant specially the videos. I usually have to edit (add or remove) a few here and there but the layout is started and sometimes the hardest part. I use my assistant all the time. I am impressed by the way AI powers features in this app and drives engagement. Fantastic App. Easily way ahead of competition. Amazing for saving photos to make space on your phone. Also if you need to transfer phones use this it makes it so much easier. I have pictures saved for years. I never worry about losing pictures since I got the app. It gives you memories, makes cute videos. Try it you won’t regret it. Google photo app is the best! This is by far my favorite photo app! I love how it makes videos of pictures and videos I’ve taken! It’s probably my favorite app! Awesome. Love that it sends me unexpected reminders of past events. Greatest app for your photos ! !!!!! Best app I've ever downloaded. I always fretted about backing up photos before, now it's effortless! I love the suggested photo enhancements and video creations! One of the greatest photo apps! I appreciate the automatic back up feature that Google Photos utilizes. I know all of my pictures are being saved. All your photos backed up with easy access to them when ever you need. The best. I can’t readily filter or sort by EXIF data. I can’t readily correct dates in bulk without advanced features. Renaming in bulk would be nice. Deduplication would be great. Tagging would be great. Sorting by date alone in Drive makes it awful to sort through photos. Great photo app, great automatic phot creation and animations. Well done Google. The only part that I wish was available is how the background can be black and white (gray?) and the person is in color. Google Photo creates that and sends it to us but we don’t have the option. I enjoy working in this app! At first, I had a hard time trying to figure it out but now I know what I’m doing and am especially glad I have google photos because two months ago I had to put my oldest cat to sleep. I was so depressed but with google photos I was able to make a movie with some of the photos I’d taken over the years of my cat. It has photos and video clips and music and I watch it often. I was able to save it and even download it to my iPhone and my iPad so that it isn’t just in the google photos app. I’m glad I have the google photos app because it is free unlike iCloud which expects you to pay after you’ve used up a certain amount of space. As soon as you access the google photos app it will back up all the most recent photos you’ve taken since you last accessed the app. If you are paying for iCloud space you might check out this app and be pleasantly surprised, I was. 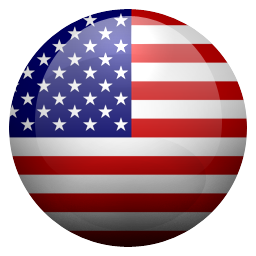 This application is very good and I am enjoying a lot. Animation, movies, stylized photos, photos enhancement etc. are excellent. I have yet to make a photo book which I will do very soon. Thanks. I believe Google photo brings your most precious moment into reality. Keep up the good work, Google! I've had an iPhone for almost ten years but I love Google photos with their unlimited free photo storage so much so that I'm going with something other than an iPhone for my next phone. I will likely try a Google Pixel 2 and hope the photos are seamlessly stored on the Google cloud. I hate the way Apple tries to make a dollar at every turn off of their loyal customers. Shame on you Apple... hooray Google! I am very upset about Google Photos and RAW photos. I was hoping that when I upload RAW pictures taken off of my iPhone 7, they’ll be able to be downloaded in RAW. However, this is not the case. My RAW photos have been converted into JPEGs, and this makes me very upset. Overall, the app is wonderful with its unlimited storage, but on the downside with RAW photos, this isn’t the case. I would love Google Photos if they didn’t convert my RAW photos, so please make change this Google. Easy way to save your photos! Save to keep pictures and perfect to give you memories. I love this app! Definitely helps keep my pictures organized! And backs up my pictures effortlessly!! Google photos is my memory cell. I never thought of organizing my photos is so easy. It’s like electronic memory that I have to keep everything I took that have a correct time, date, most importantly the exact location with backup that I would ever have to worry about having my HD corrupted! I love how I can download my photos to the app and delete them off my phone to save storage. I recently got a new phone, downloaded the app, and had all my photos back. I've had no problems so far. It’s a bit confusing but what they are storing for me is pretty adequate for my needs. It would be nice to know I was storing the original quality but I don’t need another monthly bill besides Google Drive. It’s awesome the way they rotate some of the photos for you or give you that option. I wish they would do more in terms of the facial recognition so that you can correctly date some of your photographs were the dates were stripped in the uploading process which for me was a bit of a hellish experience because it crashed while uploading. I got past all that and everything I own is in my Google library I just don’t have them sorted properly. I’m hoping this will be done automatically in the future using the facial recognition technology otherwise I have to spend years fixing my library. Another suggestion would be if they would show you your duplicates which are close to exact duplicates so that you can delete them on your own. Sometimes it appears to be refusing duplicates but it’s hard to tell exactly what Google is doing behind the scenes occasionally I’ll see a duplicate missing other times I find odd photos in my trash. It would be nice to know exactly what’s happening with them folders. Those are all my suggestions and why I don’t have five stars I appreciate the free storage in the meantime hoping I won’t have to go with higher quality photos in the future. I was living the full-storage life. You know...when anytime something important or special happens, you try to take a photo but you can’t? I even cheated the system frequently and took photos through the Instagram app and saved them to my phone so that I could still take photos. Yeah well...my phone started crashing (#toomanyphotos) so I had to figure out a different solution. In waltzes google photos. Blessed assurance, y’all! I deleted two apps to make room for this one on my phone. As soon as I had backed up enough photos, I re-downloaded the two apps and then continued backing up my photos. -which happened to take about 5 minutes of backing up before I could download those apps again. THEN, I downloaded another app to look for plane tickets to São Paulo (guys, this storage is FREE!!) and checked the progress of the backup between comparing flights and learning Portuguese. True story. I was delighted to find that I could delete several thousand photos off of my phone, yet still access them quickly through this easy to use app. BLOWN.A.WAY. Guys. If you’ve deleted the “Stocks” app, every text message and attachment, and have resigned yourself to drawing photos of your friends and family on special occasions because your phone is out of storage and you don’t want to pay $100...GET THIS APP. 👊🏻 Tso good. This is the first review for an app I have ever wrote in my 9 years of using Apple products from iPhones to iPods. Genuinely this is the absolute BEST solution to modern photo issues on mobile devices to date. I have all my photos downloaded to my phone, and they all download to my other devices as well. When I delete it on one device it does it on the other too. All my photos are fully HD and even Live Photo’s show up as videos/gifs. When the hopefully not inevitable day comes and I break my phone, I will never have to worry that I lost my photos, the biggest fear for first world citizens of the world nowadays, because there will always be a copy saved somewhere. On top of the convenience of this app, with it not only being full compatible with everything, but just overall simple and easy to use. It completely devours it’s competition due to its unlimited storage and functionality. Never again will I receive the obnoxious notification that my 5gb iCloud storage is almost full on a phone that has 128gb. With APPLE telling me that I have to PAY for more storage that is NOT even UNLIMITED and not nearly as compatible across non-Apple devices as google photos. Google has always been the go-to for tools online, and they outdid themselves on this one. Hands down to them. 5/5. Hands down, The best app for safe-keeping & family sharing of life's most memorable moments. 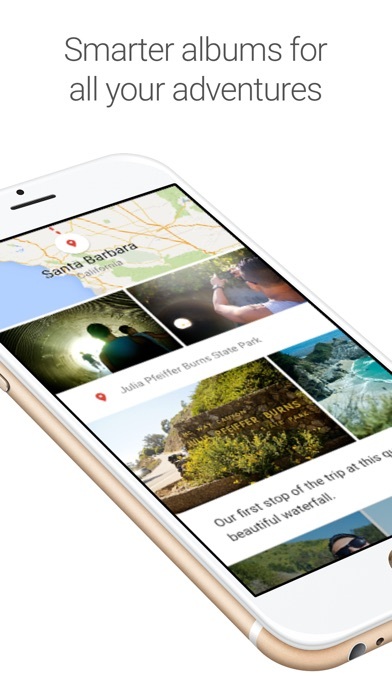 Super easy to navigate all of the features like saving the all of the important details, like location, time & date, and captions of photos to share with others. As a busy, single mom of 2, this app is a lifesaver for me. I can share my children's milestones with family & friends with such ease so no matter how near or far they are, they can watch my babies as they grow. I have a closet full of craft & scrap book supplies that I have picked up here and there but with juggling my career and my 2 little girls, I feel I never get the chance to actually sit down, go through the pictures & videos, take a stroll down memory lane and bring all of my amazing Pinterest crafts to life. Google Photos has simplified the overwhelming fear of feeling like there's so many important details that I won't remember while scrapbooking my 2 girls. It simplified the task of going through and sorting my pics & videos I've backed up over the years and it's helped me to be able to organize and group memorable moments from their birth so that I can start to put these special books of their most memorable moments together. Google Photos is the only way to go! It’s the only way to go, if ya ask me! I know, ya ain’t asking, right? Okay, well that’s just fine, because I’m just-a-tellin! What I’m telling is that I love this App, because of so many things I won’t be able to list em all! Totally impossible! But I can share a few reasons why I love it so much! One is because of the option of assistant! When you choose this it gives you an option to save or dismiss the Apps, altered & filtered or maybe, brightened & cropped, or maybe, actually I can keep going but you get the Jist of what I’m sayin, right? You won’t believe the things assistant can do to your pics to make them look better or make them look like a work of art! You just won’t believe your eyes, or that you even took the pic in the first place once you see what all it can and will do! Lol woo-wee! I love this so much! Don’t waste your time with any other App out there claiming to do this or that! This one doesn’t have to claim anything, just open it up and Vola! Lol Art, Beauty, Imagination & I can keep going..... you already know! I’m going to stop here and let you see for yourself! The App speaks for itself! Plus I’ve spoken way to much as it is! Jeesh! Lol Y’all will have a blast and enjoy! I know y’all will! Lol Chow! First, most of my computers are Apple, and I take a lot of photos with my iPhone. This Google app/ system is ok for users that want to take snapshots to post on social media. As an Engineer and technical craftsman, I can’t discern if there is any way to use it for these purposes. My requirements are for technical photographs showing processes and assemblies mainly to send to publishers (and to publish on-line) illustrations for engineering uses. From what I can determine, is’s not too good for that, although I have never purchased a “For Dummies” book and learned the full capabilities of Google Photos. However, I vastly prefer it over the Apple Photo program that takes control of all content, holds them hostage, and deletes them if you don’t want to play by their rules and pay their fees. I actually purchased a Windows-10 laptop for my phone and camera downloads rather than struggle trying to convert and download my pictures to something a user completely “Apple” can use. I do store my social photos ( family, weddings, and vacations, etc.) on Google Photos, simply because they separate them by date and Google doesn’t mess with them further. And, you can download photos to a thumb drive and take them to a corner drugstore photo printer and gets prints for Granny, something impossible with anything Apple. I like Google Photos, but I wish their was an option under the "EDIT" tab, where I could add text or be able to write on the actual photo and be able to pick different colors, fonts, size of fonts and also underline, bold or put the text in italics. Also, my email is also linked to my son's phone, since I don't want to set him up with his own email account, until he gets a little bit older, that means that the Google Photo app is also linked to his phone, since he takes photos too. It would be nice to have an option to put a password protection on the albums that photos of each person is under. For example, if the album is labeled "ME", I wouldn't want him clicking on the tab and see photos of his mother that he shouldn't be looking at and scar him for life. Lol! Also, it would even come in handy when parents let their children play on their phone and they stumble upon photos that their parents didn't want them to see. 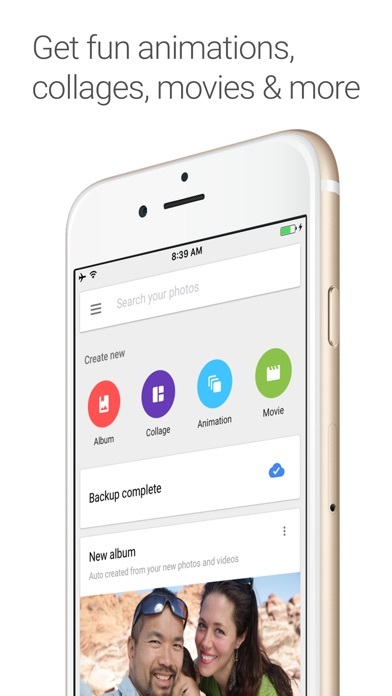 Since my son also takes photos, one other idea that I had would be that anytime he takes photos and Google Photos downloads them, that the photos would be categorized by the device it was downloaded from, but you would still be able to organize the photos into albums later. Thank you! Finally! Google, helping to create peace of mind when I run out of storage for my photos! I am upgrading my iPad and have a library of photos and videos on the iPad and synced with iCloud. 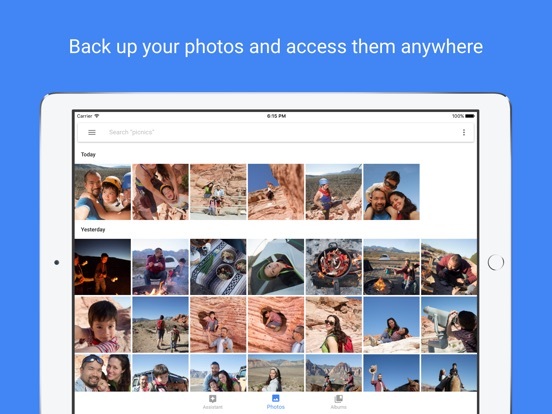 Download the Google Photos app and give it permission to access your pictures and it takes over. Could not be easier. Be sure to manage your iCloud upload capabilities on your device first and decouple the device from iCloud. This is relevant, I believe, because it has taken a week to synch up ~300 videos from the iPad to Google Photos and in the meantime new pics (from all apple devises sharing the same Apple ID) get shared around to each other making the Google Photos install a bit less straightforward. This is the second Saturday I have been working on this and am now down to roughly 30 videos to get over to Google Photos. Almost done! Bugs I have encountered are minimal, but the count of pics/videos to transfer over is not a reliable number and the "upload in background" setting is not available to me so the app runs in the foreground. I had to upgrade storage size at Google -- for a fee -- because I wanted to keep original resolution and now I am curios about how Google Drive may be useful but don't know if Google Drive and Google Photos "play nice" with one another. I admit it’s good for keeping photos backed up but I have another issue. There is a delete option for pictures and videos. I’m able to delete them, go into my trash, and delete forever but when I close the app and go back in, they’re all back. I’ve restarted my phone, made sure the app was updated, look up it up and couldn’t find anything. Pretty much everything I could do, I did. Point is, I’m in desperate need of storage and deleting thousands of really, unneeded photos is probably the best way to go. I don’t have many apps, just a lot of photos. My photos automatically back up so I don’t have a chance to go through them before they’re saved to my email. The app isn’t organized and nor are my photos. I go in to find photos that I may need and can’t find them. I’m sitting for hours before I find anything. I take lots of photos. I do a lot of photography and am one of those people who loves taking photos instead of living in the moment. I’m contemplating on just deleting the app and going on to use something else. Plus, it’s really buggy and slow. It’s constantly asking to “make space” and delete the pictures in my photo library. When I say no, it just keeps popping up every 5 to 10 minutes. Apple users, honestly just use photo stream. It’s a waste. Very nice photo storage app, easy to use, and offer many options of pictures layout and searching. Ive got it a month ago, and between my iPhone and the windows google photos app I'm still finding new things I can do. But one thing I cannot do (or maybe I didn't discover it yet) is to check what pictures belong to an album. The pictures' description doesn't show it. All my 25,000, and counting, pictures are organized in albums. If I don't place my photos in albums every time I take them, there's no way I can find out which picture was last that I placed into an album. I used Flickr before and it was very easy to check this, not only from the description (that shows you exactly if a picture belongs to an album or not, sometimes I discovered I had pictures belonging to 2 albums so I removed it from one of them), but when you take new pictures, they are placed, by default, into an album named "auto upload", so that you know exactly what pictures do not belong to any album. I wish Google had this feature.....at least let us know from the description. Otherwise, very happy with this app. Best App/Program on the web!!! I was always worried about eventually losing pictures and have no memories of my life when photography went all digital. However, Google Photos solved that problem and it’s really astounding what it does for you automatically. I have a DSLR camera, and I was also worried that I would have to always take pictures from the phone or transfer them to my laptop, but no not only does Google give you unlimited storage, it automatically stores all the photos nicely organized albums from any device you own. Next they are hard at work putting together albums or special effects etc., something that would take you hours to complete if you even knew how! Honestly, I could do without many programs and apps, but the two of my favorite apps, Google Photos and Google Play Music are making me want to consider going with all Google products,laptop,cell phone,chrome cast etc. I have an I phone and while Google Photos keeps up with those photos, the I phone only has photos from when I started using the phone. Google photos keeps them safe and secure! Unbelievable App! Google photos is terrific and they have certainly outdone Apple in the Photos app department. 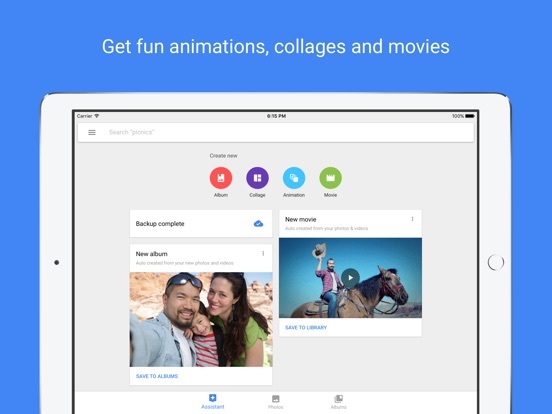 Sad that Apple can’t even make a better photos app than Google for their own devices. Google Photos has Apple Photos beaten in so many ways: 1) Google Photos shows camera info and even lets you edit the time of a photo. 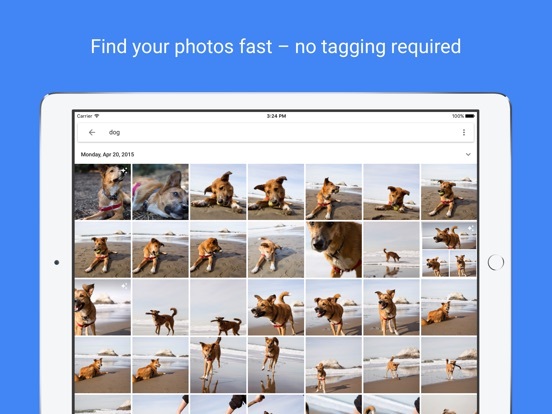 2) Google Photos allows you to add descriptions to Photos. 3) Google Photos actually organizes your photos chronologically. Apple says they do in the Photos tab, but they don’t. They organize first by location than chronologically. It’s ugly. 4) Google Photos gives you a speed scroll up and down. 5) Google Photos allows for multi line album names. 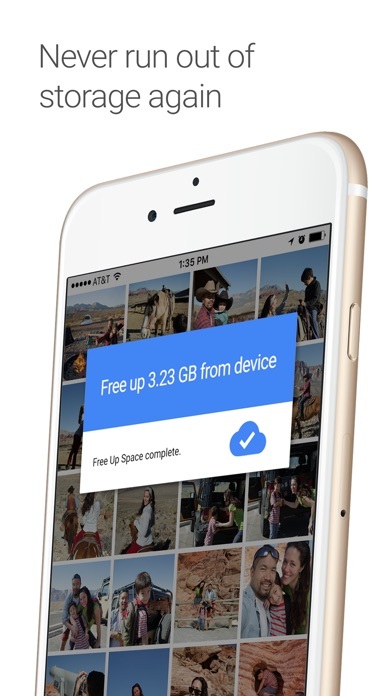 6) Google Photos offers free photo storage (full resolution for Pixel owners) and (high resolution to everyone else). 7) Google Photos offers much nicer filters. 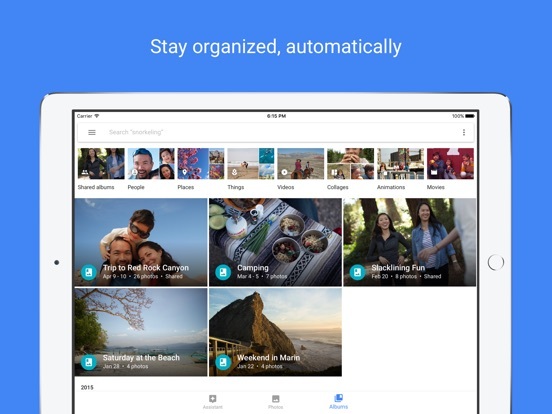 8) Google Photos has much better smart organization for their people, places and things Albums. Google Photos is everything that Apple Photos isn’t. It still isn’t perfect, but at least it respects that people can think for themselves and offers many features that Apple Photos should, but doesn’t. I take a lot of pictures with my phone and with my SLR. I have a large extended family and lots of grandkids. I have 200,000 ++ digital photos dating back to my first digital camera in 2001. I have digital scans of old 35mm slides. All this has been sitting on my hard drive doing no one any good. I have uploaded each folder of photos on my hard drive onto GF. Each folder on my PC has become an album on GF. This resulted in the creation of hundreds of albums in GF. Once in GF, I then share each album with the appropriate people for that particular album. Google’s artificial intelligence (AI) is scary good. The facial recognition is awesome. It is able to recognize my brother at age 75 all the way down to age 8...automatically! Below age 8 GF needs my help sometimes. So finding all the photos of uncle Harry is a snap. Now all my kids have all the photos related to them on all their devices. All searchable by person, date, location, setting (beach, mountains, etc). They love it. I love it. All unlimited and free. I still keep my SLR RAW files on my PC, but I have now made all my photos accessible to family and friends. Simply amazing. Organizes your visual life impeccably with little to no work on your part! Google photos does a very good job of backing up unlimited amounts of photos and videos for free. It doesn’t end there! Google photos does a great job of recognizing faces places and objects on demand. Another great feature about this app is the fact that one can go on a trip and within a day or two of returning, google photos has prepared a photo album that you can edit, caption, and add to based on the geo tag of each photo. As if all of that wasn’t enough, google photos allows you to edit your photos and videos within the app, save them, and then share a single photo/video or groups of them with friends or family via a web link. This gives you total control of what others see. The fact that google photos is secured with your Gmail address and password, means that you can login to view your photos practically anywhere you have an Internet connection. Best photo and video software I have ever used...in fact, everyone else is rushing to copy features already perfected here. Try it. You'll like it. Promise. I cannot think of a more useful app like this day to day. I have a 64GB iphone and my friends always flex on me because they have 256 GB or whatever. Now i flex on them because i have UNLIMITED STORAGE!!! I can truly say this app is a miracle worker, because otherwise, I would have to upload my photos to icloud where my ENTIRE family could see, but now there is this. The app is great but it is VERY slow. I have about 3000 photos to back up, and I expected it would take maybe 1-2 days. I even tried to not take anymore photos until it backed up fully so I don’t overload it or anything. Boy was I wrong, it has been 2 WEEKS!! AND I STILL HAVE 300 photos to back up. For some reason, the number keeps glitching, even though I’m not taking photos, the number sometimes keeps going up. One day I’m down to only a 150 photos to back up, a minute later, I have 291 photos to back up. I understand it may just me my slow phone, but this should be compatible with all users. I decided to upgrade just for this reason, and if it doesn’t work then, I will give it a 3 star rating, if it works, I will change my rating to a 5! Thanks Google!!! I’ve used Google Photos since launch. It works fine at first but as the amount of metadata builds up, features start to break. First it was “sharing in progress; keep app open to finish” that would last for days at a time despite it appearing to complete immediately. Then one day it just stopped syncing edits, at all. Next it started failing to show new photos that had been downloaded locally and not yet uploaded. Around this time it also started uploading duplicates of things. At some point during all of this, assistant creations began failing to save. They would show up again every time I opened the app. Shortly after, it stopped showing new assistant suggestions and only the old “stuck” ones that I couldn’t clear or save. Somewhere along the way, it halved the number of photos it was tracking for backup from 3,000 to 1,500 without me deleting anything locally or freeing up space. Reinstalling the app fixes some but not all of these issues, and only for awhile. Buyer beware. You’ll get hooked by all the cool features and then it’ll start to fall over. Also, there is absolutely no support whatsoever, which is sad because I actually bought extra storage for the service. I’m a paying customer and there is literally no way to contact Google about any of my issues. I'm preparing educational collages of many species of trees: full height, and closeups of leaves/needles, flowers/fruits or cones. Examples are larch, basswood, katsura. I choose the same 3 photos or 4 photos repeatedly in hopes of getting the specific arrangement I want. If there are 3 views, I want the full height of the tree to be the full height of the collage. Sometimes the app won't give me that. I wish I could see a set of diagrams. Suppose I select a diagram with 3 vacancies. I want you to label them first, second, third. The first photo I select goes in position #1, then #2, etc. If I want the biggest picture verticle on the left side, all I have to do is choose the right diagram, note the number in the tall box, and tap the tall tree when I get to that number. I think it's logical to name the biggest box #1. I'm not asking for ability to select the dimensions of the boxes; I like what you have now. I'm not asking for new diagrams; you already offer a full set with 2, 3, or 4 photos. If someone selects more than four photos, they should accept whatever arrangements the app currently offers. The permutations & combinations are too numerous. I’ve been using google photos for over two years now and it has been an innovative, reliable way to backup photos and videos. The search feature is magic. There’s no other way to describe it. I searched for “headset” and a picture from five years ago popped up with me in the front seat of a small airplane with a headset on...it also somehow correctly recognizes people from birth to adulthood. I don’t know about you, but I look nothing like I did when I was two years old. There are a couple improvements I would suggest though. First, editing photos could be significantly more robust. It currently has all the basic editing features you would find in most default phone photo apps. Second, a more clear, innovative organization method would be very handy. As it stands, I have tens (maybe hundreds) of thousands of photos all arrayed in a vertical flow with the months/years denoted along the side. Perhaps the option to automatically organize/rearrange into (gasp) folders by year, event type (wedding, vacation, etc) or person and other categories. Just a thought. Generation X and Baby Boomers have some say in this World of Technology! Typically we purchase the iPhone with less memory space available because let’s face it, “we’re not that techie”. What we fail to realize we’re going through that stage of life with the plastic pull-out wallet photo album our grandmothers use to whip out on everyone, strangers on public transit included. The only difference, our whip-out photo album is on our cell phones. Suddenly you realize with all those photos and videos of the family, and your memory capacity notifications have you wishing you had bought the phone with more memory! THANK YOU GOOGLE PHOTO APP! You have saved the day! I can store my plastic photo flip-out album now on my Google Photos and have memory to spare! The navigation on the app is so simple for all us “not so techie” 50+ people. The document archive is a great feature too. No more searching through photos for those paid bill screenshots. I also love the photo editing suggestions, considering I’m not a professional photographer. This App is a must for all 50+! I ran out of space in my iCloud and had to find something to back up my photos. I use Google for most everything else so it made sense to use it for photos. I like that you can access the photos, along with all the other Google products, while logged into my google account. It automatically uploads pictures I’ve taken onto my phone and when I need to free up space on my phone I can choose that option in google photos. It’ll send all of the pictures uploaded to the deleted file on my phone. There are a lot of photo products out there that have an option to upload photos directly from Google Photos like Shutterfly or even choosing pictures to have printed at your local Walgreens. The only complaint is that I wish it didn’t take so long to load the pictures and when you first click on the photos, it’s a bit pixelated so it takes a while to clear up. Although, it does hold a lot of pictures for free so I’d rather it continue to be free than those complaints be corrected and pay a fee for faster/more storage. My family and I started using Google photos as a way for us to share all the pictures we capture when we’re together and soon realized it’s a great way to share photos from when we’re apart as well. I love how easy it is to share photos and albums. Works really well with my iPhone and allows me to keep my storage space on my phone freed up for more photos! Another cool advantage to this photo sharing platform is the stylized photos and movies it randomly makes and suggests. I only wish I knew how to make a stylized photo or action photo on my own. Google photos allows you to save and search by faces and places. This includes even searching for your dog! It’s a little scary how it makes a movie of “They grow up so fast” which is a compilation of photos of my baby from infancy to toddlerhood - how does it know it’s the same kid? Incredible and freaky. In summary; I recommend Google photo to everyone that’s looking for an app to save and store photos. It’s incredibly simple to use and does the work for you. Im adding tis later, it also does auto backups, allows you to decide what to take off the device, but keeps it safe in the cloud. Awesome..i just keep smiling —————— The best thing about this app, Google Photos, is that it does complicated things, Things I could figure out but would struggle with and take time, it makes albums, collages, searches for all pics of an individual, etc and offers it for my approval. Truly makes me look smart when I give them as gifts to my family. LOL truly it does make it so easy to group photos, Mix them around in a different format, do albums targeted to different people all with the Ease of touching the screen. ..... And of course ,the fact that it on its own . Goes out and find a way to mix up the Photos, taking your photos and turning them into a video is just awesome. And of course I review everything before it’s finalized so if I don’t like something I just do it again or have them do it again. Again,Thank you so much google developers. You’re the best! If you just use the “High Quality” upload size setting, you literally get storage for unlimited amounts of photos. And by unlimited, I really mean unlimited. I currently have over 5000 photos in storage and I’m constantly adding more with 0 downsides. Plus, being able to access your photos (as well as being able to download them) from basically ANY device that can access the internet is a huge benefit! Couldn’t recommend this enough for anyone that either has a ton of photos and videos and just want a backup for all of them and/or have storage capacity issues on their devices due to the amount of photos stored on it. All you have to do is have a Google account (i.e. have a Gmail account), log in to Google Photos, download the photos to it, and after it’s done backing up all your photos, you can then delete them all from your device and still keep all those photos and videos as well as be able to access them from basically anywhere! 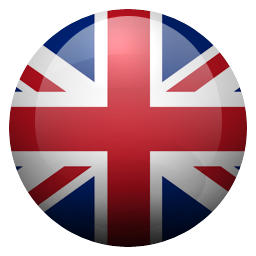 Amazing app and cant recommend enough! I am wondering why I never utilized this app BEFORE now? I love that it connects photos from my iPad and my iPhone IMMEDIATELY... unlike Apple. In real-time photos from my iPad, iPhone and MAC are all uploaded seamlessly without me ever thinking about it. Apple products can be connected to WiFi and not operate any where near that efficiently. Not to mention the fact that I need to pay out-of-pocket for iCloud storage to protect my precious photos on their devices. For years I’ve panicked if my photos weren’t backed up, hoping nothing would happen to my device until I could afford to pay for my cloud fees again. Now I never have to worry about that ever since Google has tons of storage! Google has me covered for FREE too! & *IF* it can get any better, every time I open the app there are new stylized pics, collages, and animated photos that Google has created for me! It makes my job easier and preserves memories in ways I may have never thought twice about. I highly recommend this app, and I consider it a MUST HAVE. The user experience in general is pretty straightforward and useful. Photos automatically get updated into google pictures and then they have a feature that helps delete photos on our phone. Great. I believe I could even teach my mom this, which is saying a lot. This is where they fall flat, all the suggestions with collages and animations cover the useful feature of cleaning up photos. It just confuses some users (for example, older adults) and makes them hesitant to press anything and turns them off from using it. Perhaps they should move that as an extra setting and not part of the mAjor automatic experience. Second, the shared album is separate from albums which also confuses older users. I think if they could clean up the “bells and whistles” they would reach a broader audience, but also if they have a broader audience current users would probably be more active since then they could really take advantage of shared photos. The logos without text can also be confusing for some users. So overall really great concept, but the user experience can be fine tuned to really be easy to use. No room for the latest iOS update? You probably are like a certain friend of mine who takes pictures of everything and texts pics of every meal she eats when traveling to new places. Your photos are great, but they are hiding out in text AND photo storage. Why do you need them in both places? In fact, with this app you don’t need them on your phone at all! If you are cool with Google knowing almost everything about you, which it probably already does, then have no fear! This will solve your storage problem and make room for stuff you need on the phone. Set-up takes a while if you have multi-gigs of photos. Let it do its job and follow the Assistant’s guidance. Once done, install the latest iOS to see what you’ve been missing. One shortcoming I haven’t found an easy workaround for: if you are already in a text or mail and want to send an older picture, it’s not easy to browse through your photo library in Google from within the mail app. This app pretty much does it all, as the best backup app I’ve found and it’s creative Assistant. I’ve yet to run out of backup space and I have a ton of photos and videos. I don’t know how or why that works so well, but why pay for online backup space if you can use Google Photos? The Assistant suggests ready-made albums, makes movies, creates stylized copies of some of your beat shots, and even brings back memories from years past to see again. About the only thing I don’t like is how fast it backs up your photos if you leave that feature turned on. So if you haven’t had time to delete some of the photos you don’t want to keep in your phone’s Photos folder, Google Photos will have already backed them up. Then it’s a little cumbersome to synchronize what you want to save. It also backs up your media on multiple devices, which is very handy because you can view all of those photos and videos in one place. This is definitely a sleeper 5-Star app! I like how easily Google Photos backs up my photos from many devices, organizes them by person (and pet), gives suggestions for changes and archival, and for making photo books! There are two improvements that it could really use, though: 1) The movies are really bland and boring, especially when compared to the iOS Photos app. It’s just a basic slideshow and the music cuts off suddenly at the end. Automatic effects, panning, and music that at least fades out would be excellent. 2) More feedback for grouping people and pets. Much like how facebook works, being able to tap a face that hasn’t been identified and identifying it would be so helpful. It would help Google learn what faces it has trouble recognizing and make sorting the photos even better. Other than that, this app is absolutely incredible. It has a clean, easy layout and the free storage is perfect for everyday use. I would love to see this technology used with a digital picture frame to display photos because of how well it sorts and edits them. I just hope Google don’t hold my life in pictures as some kind of ransom, later on down the track. Google can be bought and sold right? Along with all my data. Putting faith in a company like this is a huge deal but they are not a country. They have no governing body that is connected to the people so... when you hand over your life in pictures, your facial details and all of your friends faces, places and times are essentially owned. There will be AI that will find patterns in people’s experiences gathered from this data that will be used to manipulate people in ways that we can’t imagine and probably won’t notice. And I know all this and yet the app makes it easier for me to enjoy the thousands of pictures that I’ve taken in my life. It uses algorithms to sort and make use out of all these captured moments. It’s really wonderful. So google you can have my pictures and data and the ability to manipulate me in some kind of emotional bliss, in exchange for this awesome service! Game-changer. Google did an outstanding job at making a service where you can back up as many photos as you want and share them with your friends and family. In fact, this is the best service I've seen to do the job! Even though the picture quality isn't what it originally was, the photos are still in high quality. You can use the backup & sync app on your computer to sync your whole Photos library to Google Photos, which I've done and works well. I saved a ton of space on my iPad by syncing everything to Google Photos via this app, so if you're running low on storage this is an app that can save you. The awesomeness doesn't stop there! You can comment on photos, add locations, and best of all - you can use keywords to search pictures in your whole library! So if you want to find pictures of your dog in your library, you just search "dog" and a bunch of dog pictures magically come up! No tagging is required! Of course it's not perfect, but I've tested it with different keywords and it's still well done. One more thing, you can easily tag images by faces. Just enter the person's name and it'll automatically associate all pictures with them! The face detection is really good, and still finds photos with the same face if a kid is maturing. This service is a masterpiece, and it's a safe place to store all your photos. They pictures are automatically marked private unless you share them, so you don't have to worry about privacy concerns. Google Photos is a must-have app. I'm very frustrated with this app because I downloaded it to help me with the storage issues on my phone, but it's giving me separate issues of its own! The app says "backup complete" at the top of the page, but many of my pictures still have the white arrows going in circular motion. When I access google photos on the desktop, those items do not show up. I spent hours looking it up in forums and trying to fix it based on all the recommendations in forums, but nothing is helping. Only when I manually select the items and click "back up" do the arrows disappear, and it is irrational for me to sit there for hours selecting the items one by one when the app is supposed to do this automatically! On top of that, the app does not back up my videos. I really wanted this app to be worth it and to work for me and I'm very disappointed that it's not. Now I have to seek another solution and waste even more time worrying about this. At this point I'm not even sure if I should trust this app or continue using it, and I would not recommend it to friends with the issues I've been having! Save your energy and don't get this app!! -To Google: if I am contacted and the issues are fixed then I will change the review ..
Auto back-ups provide peace of mind, but that is just the beginning of why google photos is awesome. The ability to quickly organize photos into albums and seconds makes finding photos later easy. Sharing photos with friends is also amazingly fast. The auto assistant often makes great animations and videos from my photos, but I also have the ability to make my own custom animations and videos and the tools are intuitive and simple to use. Ability to find photos by searching for both thing and people is also quite impressive. My wife and I are also able to sync up our photos into a common space so that after any event pictures can be found organized by date and time. I also love that I have access to every photo I have ever taken because I have uploaded all the photos to Google Photos. I recommend it to everyone I know because I love pictures and this is the best tool to Save, share, and edit quickly photos and videos. I love this app for a couple reasons. 1) the Auto Awesome recommendations made my the assistant are brilliant. They take what is otherwise an ordinary picture and enhance it to be something much more special. They give life to pictures. No other service does this and for free. 2) the search capabilities. I have 10s of thousands of pictures and searching through them could be a nightmare until now. 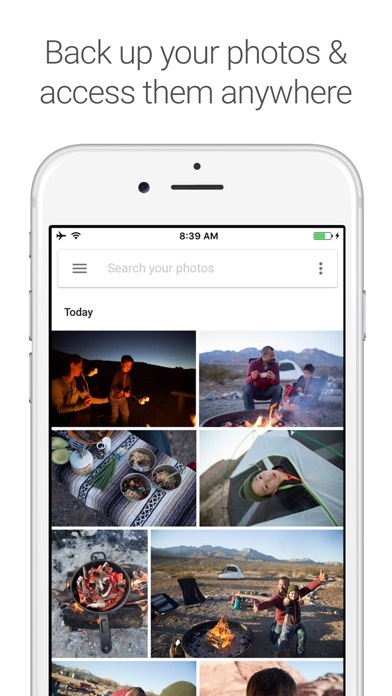 Google Photos categorizes your photos based on location and the subject of the photograph itself. It's accuracy in being able to detect the subject is rather uncanny. I can now search my pictures far easier than before. 3) I know I said only 2 reasons but this one is important too. Free! You can upload your pics for free! Enough said. Some improvements I would like to see would be an option to delete the originals once they have been successfully backed up. NB: I do not work for or am in anyway affiliated with google. Just a regular consumer of its products. I have used this app for 5 years to backup all of my photos and videos. It does so automatically, straight from your library, without ever getting in your way. The app has saved nearly every picture and video I’ve taken in that time. It just so happens that 5 years ago is around the time I met my wife. 4 years ago is when my first child was born. This means that every picture or video of my wife and my kids, all of the firsts and lasts and everything in between, they’re all here. There are so many beautiful memories here that I can hold onto forever because of this app. I love scrolling through the years and months and just watching life’s story. The app is designed in a way that makes this easy and puts a strong emphasis on your media, rather than clutter. It even helps you clear clutter such as unimportant screenshots, document images, and even blurry or duplicate photos, so that you can focus on the special things. The Assistant that is built into the app makes everything so convenient. It has created so many amazing movies, collages, and animations for me (without me even prompting it to) that perfectly capture the little wonders of life. I don’t know what I would do if I didn’t have all of the things Google Photos has captured for me. Half of the time I didn’t even know it was doing it, but I’m so grateful that it did. If you’re not already using it, you should start now. You’ll thank me in 5 years. I have known google photos for awhile and recently PhotoScan. My hesitation to download it was totally relieved when my son visited me this holiday. Took old pictures with photoscan and send me back all of it. He send his album and now we have shared photoscan album. I'm over 70 year old and have old pictures colored and black and white. It's amazing to photo scan my wedding picture almost 50 years, old black and white. With the editing features, it transform it to a modern looking,clean brighter,pleasant looking,colored copy. I did 3 kinds of edited pics. For comparison. I'm very very amazed and delighted how google was able to do this. I'm very sure I'll be very proud to show this to all my friend in my forthcoming, 50th Wedding anniversary. Now l am looking for more antique picture to process nd it's keeping me busy. Thanks GOOGLE. AMAZING. 5 stars all the way. Improvements is continuous. Recently sending me reminders of things that happened a year ago. I'll try to order Album for my Anniversary pictures. My phone was running out of space. I was constantly having to delete pictures so I could take new ones of my kids. Thankfully, my SIL told me about this app. I was able to transfer my 4,000+ pictures to the app in about 24 hrs. It took so long because I had so many to transfer at one time. I had to keep going in to check and manually transfer some here and there. But it was worth it. Once they were all successfully transferred, I was able to delete the pictures off my phone. The used space on my from when we 16 GB to barely 9 GB!! Now I don’t have to worry at all about how many pictures/videos I have or if I need to delete some to be able capture priceless moments of my kids growing up. I love the album storage and face recognition. It’s easy to search for people and places. I also love that it makes little videos for me to share. And that I can access all my phones from the app or my computer. I recommend this app to everyone! Best memories in a movie! I’m not one to write reviews...however this has been an amazing app which allows me to keep my valuable memories safe. I can store other items in my phone without losing videos or pics. I can change to a different phone or simply view to share with others, no matter where I am. It creates special albums and movies with the perfect title & music. It kindly reminds me about my “on this day” events..bringing me to tears at times. I can search by date or face recognition for specific memories. I simply love this app and am always recommending it to everyone. Absolutely free and absolutely great!!!!! Thank you so much google for touching my heart with all the amazing things you store and create for me. This morning I had a meltdown because of the movie you created “they grow up so fast”. Truly amazing...I literally cried...tears of joy. Being able to be transported to so many memories in such a short time it’s just the best feeling!!!!!! Thank you soooooooooo much again. Photos are daunting. They accumulate and accumulate and take up storage. This App is worth every penny ( oh wait it’s free...hahaha!) Easy to use. Yes initial set up takes a bit of time, it’s like setting up your new phone for example. But you will not be disappointed. It automatically takes the photos from my phone ( I allowed it to do this) and now I have no storage issues. Love the “people, pet” thing it does where after the first few days it generates an individual face photo of almost everyone in your photos. You can then name them and when you click on that face photo ALL their photos appear. Amazing! It even recognized my 50 year old brother as an infant and put that photo under his section. It also comes up with these really cute collages and little videos of random photos. For example, a cute little video collage of our new little kitten set to music. You can save and voila’ you have a special keepsake to share. Good job Google! 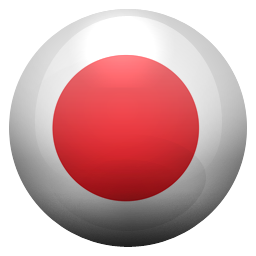 This is a great app! I have Apple products so I expected it to have issues, but it’s been fine. It’s easy to navigate and organize, both were requirements for me to continue to use it. The app syncs easily across both my phone and computer, and if you edit or delete stuff on one device then the assistant will help you to make the same changes on another device with one click. My only complaint is that it says it will identify people and pets, then group their images together. It didn’t do that for me, completely anyways. It picked up my roommate and then one of my cats, but didn’t recognize my other cat or my dog. It’s not a big deal to me, you can mass select images and group them together so it just takes a little extra time. For Apple users, there is an app for the computer that says it works with this...don’t buy it! Google has a free app that does the same thing and actually works. Pictures probably take up the most space on our phones. But originally, our only other option is to download them to our computers every so often, or when we get the warning that our phone is almost out of space. But this app actually fixed that. -pictures I take on my phone are almost immediately uploaded to my Google photos account, so I can now completely delete from my phone any that I won’t need to get to right away. 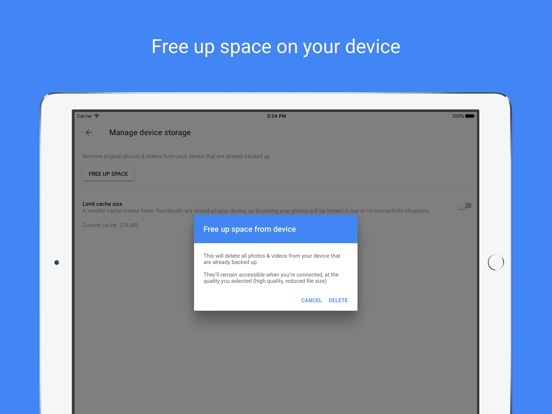 -space on Google photos is unlimited, and free! I’m guessing (I don’t know -just guessing) they’re selling them or something, because they only allow this deal if we upload full resolution pictures (nothing edited down in resolution). So don’t use this app if you take sensitive photos or anything you don’t want getting out to the public Downsides (why only 4 stars) 1) I wish I could organize them into folders. Sure, we can categorize them by tag or category (I think Google also creates a description for them to search by — for instance, if I upload a picture of my dog, but don’t tag him as a dog, I can still find it if I search for dogs), bit it’s not like the folders I have on my computer. It’s just not as easy to organize them. 2) sharing the pictures isn’t as easy as of they were on the phone. Instead, since they’re not actually on the phone, but on Google, I have to first download the picture to my phone, and only then can I share it. It would be nice if I could just do it through the app.